When you think radiological procedures, proper attire comes to mind right away. WRP has you covered with our Radiaxon® Radiation Protection sterile gloves. 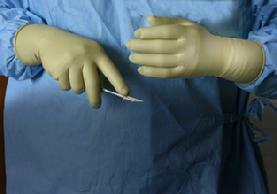 Our gloves protect the hands from the cummulative effect of scatter radiation associated with interventional procedures. Radiaxon gloves provide an optimal combination of high attenuation and tactile sensitivity. Our emphasis is on protection and constant innovation.